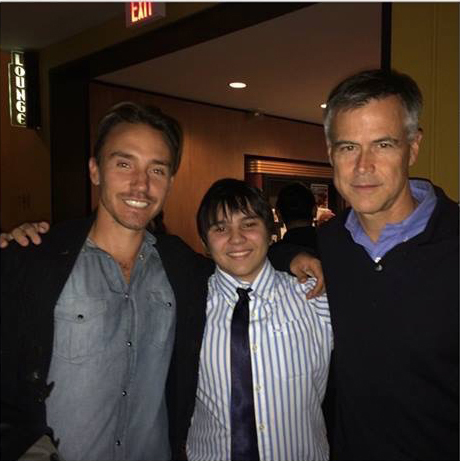 Features > The Rob Stewart Youth Eco-Hero Award first winner announced! The Rob Stewart Youth Eco-Hero Award first winner announced! This year’s Planet in Focus Environmental Film Festival is honoring late filmmaker and conservationist Rob Stewart with an award dedicated to his memory. Stewart is best known for his award-winning films, Sharkwater and Revolution. The Rob Stewart Youth Eco-Hero Award will be presented annually to a young Canadian environmental activist aged 20 or under. The first recipient of the award is filmmaker and environmentalist Jonah Bryson, 17, who co-directed the 2015 short film The Fight for Bala with Stewart. Jonah is pictured here with Stewart (left) and American cartoonist Jim Toomey (Sherman’s Lagoon) at right. Stewart was Bryson’s mentor and helped him with his feature debut, A Sweet Spot in Time, which focuses on what humanity will encounter by 2100 if we fail to deal with environmental challenges currently facing us. In 2014, Rob Stewart was the youngest winner ever of PiF’s Eco Hero Award, and his sequel, Sharkwater: Extinction, is scheduled for release next year. The 18th Annual Planet in Focus Festival runs from October 19 to 22 in Toronto.